Arizona Cardinals head coach Bruce Arians said Jaron Brown is the Cardinals’ No. 2 receiver right now. The emphasis on “right now” is important, as John Brown has been nursing a quad injury for the past three weeks. Jaron Brown played just 191 snaps in 2016 before tearing his ACL in October but has been all systems go in camp thus far. Over his first four years in the league, Brown has played 858 total snaps (21.3 percent). 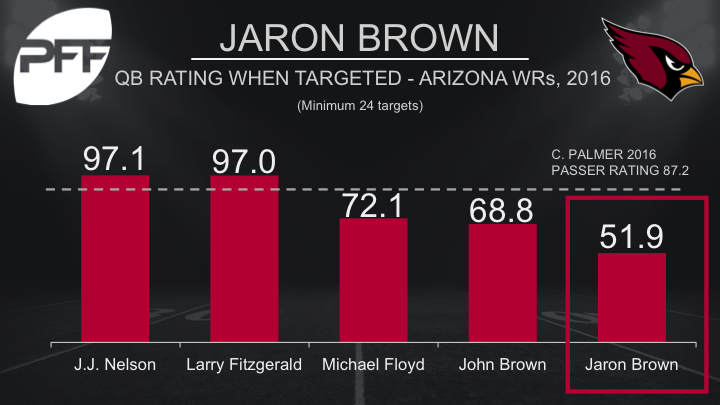 For his career, Jaron Brown has a career catch percentage of 58.9. He has five drops on 88 catchable targets, giving him a drop rate of 5.68. The drop rate league average was 7.46 for the 2016 season.